The Destiny 2 Spire of Stars Raid Lair marks the second time that a mini Raid activity has been introduced for Bungie's game post-launch. In this Destiny 2 Spire of Stars guide, we'll be walking you through everything you need to know about the second Raid Lair to hit the game, including the various boss enemies that you're going to be going up against. If you instead need anything else on the new Warmind expansion for Destiny 2, including the price point if you don’t already own the Expansion Pass as well as all the various Strikes and Exotic weapons and armor items arriving with the DLC, make sure to head over to our Destiny 2 Warmind guides hub. 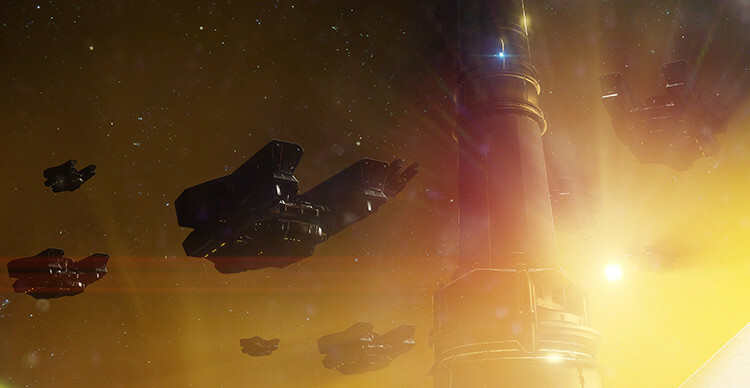 The Spire of Stars Raid Lair is the second Raid Lair to arrive in Destiny 2, as the Eater of Worlds Raid Lair originally launched shortly after the addition of the Leviathan Raid. All three activities will take place in the same Leviathan location, in the Nessus Orbit, but the Spire of Stars mode will mark the final time that we’ll be visiting Leviathan in Destiny 2, as Bungie looks to new horizons for future content. Statue Garden - For the first phase, you'll need to all stand on different platforms, and pass a white orb around. You need to keep throwing the orb around, until every pillar is fully raised, and you can throw the orb into the middle spire. Celestial Observatory - Stand on the correct plates with an orange glow, and send one person up the teleportation beam. Have the person report the correct symbols that they see, and have your team move to the correct plates. Finally, pass the orb around once again like you did in the first phase. Lay into the minions around the boss, and Val Ca'uor's shields will eventually turn purple. Grab the ball and group up, passing the ball between all of your Fireteam while the boss charges. If done correctly, you'll all turn blue, and the whole team will be cleansed. Meteors will drop onto the outer plates, and four players will need to stand on the plates. Send one team member up the teleportation beam, and have them call out the two symbols. Pass the balls to the players standing on the corresponding symbols. Throw the balls through the Greed Whisp (note that this doesn't have to be simultaneous). Have everyone standing on the plates ready to open the door. Pick up two more balls, and throw them to players with the Superior buff. Have these players pass the balls through the Greed Whisp. Pick the balls back up, and head up the beam to destroy the two ships. Throw the new ball through a Greed Whisp, then pass it between players until everyone has a debuff. Callus will begin charging behind Val Ca'uor, but throw the charged ball at him to cancel out his shielf. Now lay into Val Ca'uor all over again, and eventually a new orb will spawn. You now have to repeat this entire process again, until Val Ca'uor is defeated. Just below, you can see a very brief walkthrough of how to locate a single hidden chest in the Spire of Stars Raid Lair. You can uncover the chest for you and your Fireteam during a vertical platform section with fan blades, and in the video seen just below, the player obtains both a Legendary and an Exotic Engram. This might be the conclusion of our Destiny 2 Spire of Stars Raid Lair guide (which we’ll make sure to keep updated), but head over to our Warmind Exotics guide for a full walkthrough of all the elite new gear, or our Escalation Protocol guide for all you need to know about beating the new horde mode.